"You can learn from anyone even your enemy." 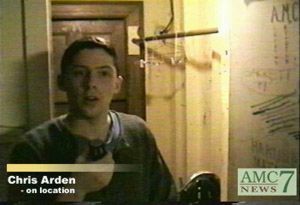 This video was done in an on-location news broadcast style. The titles were created in photoshop and composited with alpha channels. The premise of the news cast is that an injured bat is trapped in an old dumb waiter shaft. 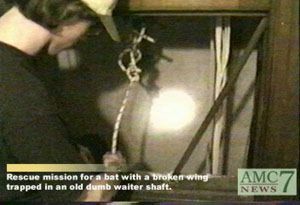 Thusly, our hero, Rob Moncuse is chosen to repel three stories down the dumb waiter shaft in order to rescue this bat with a broken wing. Meanwhile, our reporter, Chris Arden gives a play-by-play account of this daring rescue while communicating directly with the repeller. It is soon discovered, however, that there never was a bat in the dumb waiter shaft. It was all an elaborate hoax aimed at mocking the credibility of the press.